A brilliant touring car driver, Emanuele never quite made the grade in Formula One. 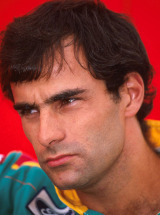 After a long apprenticeship in Formula Three, Formula Two and then Formula 3000, in all of which he took several victories, he became McLaren's test driver in 1988, before replacing Johnny Herbert at Benetton halfway through 1989. Emanuele was dropped at year's end, and drove for Dallara for the next two seasons, before going back to touring cars for good. He has raced almost exclusively for Audi right through until 2004, winning the Italian title twice and the German title once and also picked up three wins for the German marque at the Le Mans 24 Hours in 2000, 2001, 2002 and 2006, as well as winning the 2001 American Le Mans Series crown.